I could eat curry for every meal of every day. Fact. I rue the day that someone somewhere thought designing an open plan office structure would be a good idea. It’s forced me into soups and sandwiches for lunch. But if I could, this one would be a regular. For those of you who isolate your curry consumption to the evenings, I recommend you try it. It’s easy, quick and delicious and features my nut of choice, the earthy green pistachio. In a food processor or spice grinder, grind the pistachios to a fine powder and set aside. Bash up the ginger and garlic up in a pestle and mortar to a coarse paste and set aside. Put the oil in a wide-bottomed, lidded frying pan on a medium heat and, when it’s hot, add the onions. Fry until caramelized, which should take around 20 minutes. Add the garlic and ginger paste and stir-fry for 3 to 4 minutes before adding the tomatoes. Put the lid on the pan and leave the tomatoes to cook for around 6 minutes, until they start to break down, then add the black pepper, garam masala, chilli powder, coriander, cardamom and salt. Stir, then put the chicken pieces into the pan. Turn the chicken so that it seals on all sides, then add the ground pistachios. Stir-fry for a minute, and pour in the chicken stock. Lightly whisk the yoghurt with a fork, then stir it into the pan. Pop the lid on the pan and leave to cook for around 15 minutes. Taste the dish for salt and spice. You may want to add a little water at the end of cooking to ensure a sauce the consistency of thick cream. To serve, spoon over a dollop of yoghurt, throw a couple of chopped pistachios over the top and squeeze over the lemon juice. Eat with a bowl of basmati rice or some naan bread. Must try recipe! Looks yummy!! Must try recipe!! Looks yummy!! Another fabulous dish! I’ve lived in India and been cooking “curries” for over 30 yrs. Meera’s book is absolutely brilliant – the best Indian cookbook I’ve had the pleasure of reading! I Love it!!! Been working my way thru all the recipes – keep up the good work Meera – when’s your next when going to be published? Very soon I hope! 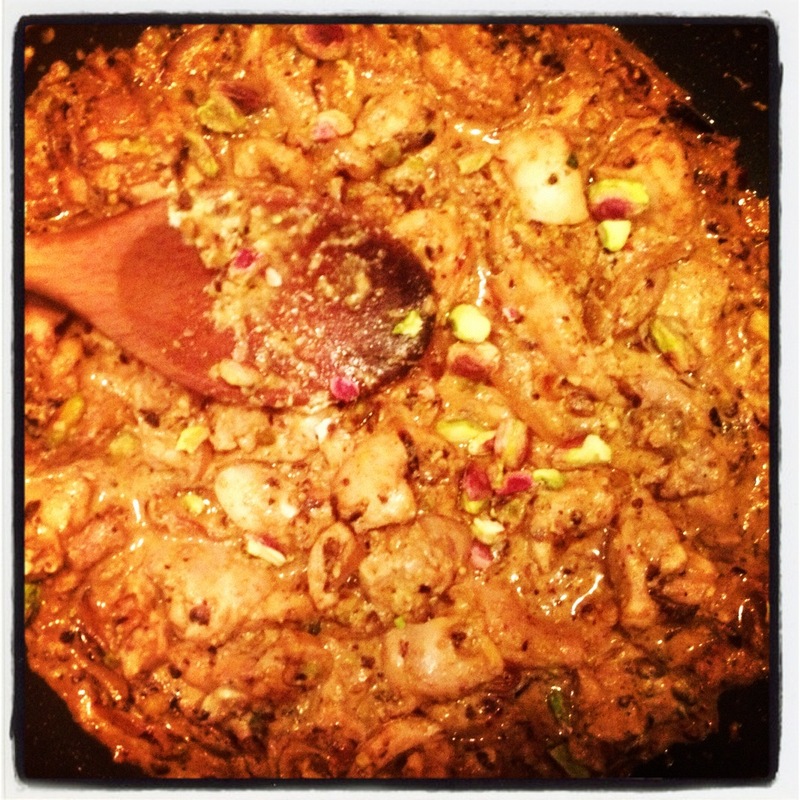 another fantastic meera recipe, this was delicious and easy!